This interview is excerpted from a longer conversation between Barry Le Va and Tad Mike, conducted in New York on October 18, 2010, and on several subsequent occasions by telephone. 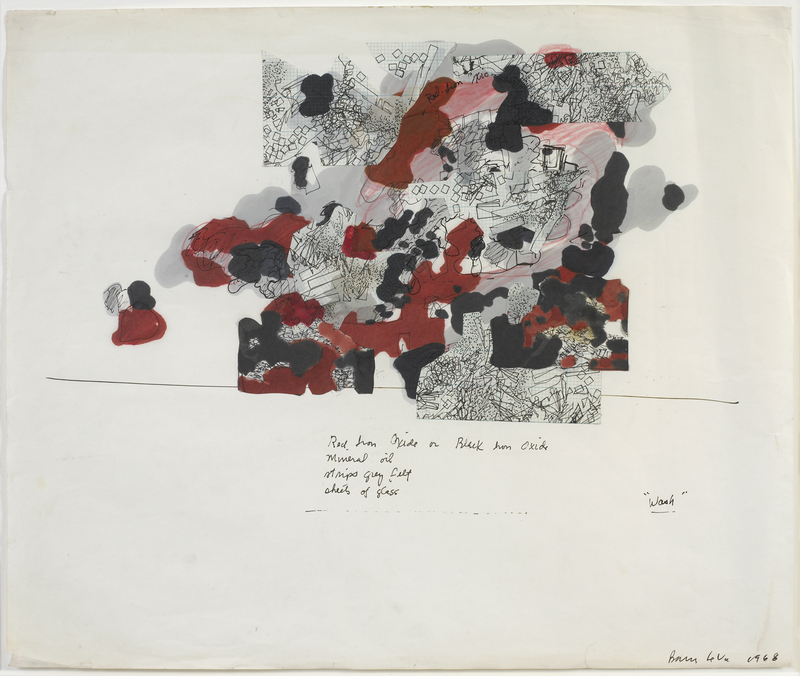 The conversation was initiated during the research phases for Mike’s essay Barry Le Va: In the Realm of Bach, Voltage and Love, which was published as part of a collaborative online exhibition catalog for Drawn/Taped/Burned: Abstraction on Paper (2011) at the Katonah Museum of Art, Katonah, New York. Scholars interested in requesting access to the full text of this interview may contact Rachel Nackman (rachel[at]wynnk.com). Tad Mike: Music was my first response in thinking about your work. Barry Le Va: It is improvisation that interests me. TM: Thinking of your work, in some respects it relates to Bach’s music. Your drawings and prints have an underlying emotional richness. The forms are composed largely of straight lines. Your work does not scream for attention, as Bach’s music does not overtly demand attention, but underneath is an impassioned voice that comes through. TM: Your drawings also look like musical scores. BLV: They are very much like musical scores. TM: What struck me in particular as I moved through your oeuvre was how the work has developed in similar ways to how some composers’ work evolves and develops. BLV: Yes, I agree with that. TM: Every work of yours that I have experienced so far implies movement in some way. There is always a breathable space in the composition, where the implication is that something has moved or is going to move. BLV: Well, that’s how those drawings from the 1980s, shown in 2010 at David Nolan Gallery, came to be. When I was making sculpture at that time, I was always arranging or rearranging something. So in my drawings there would always be some kind of physical gesture. TM: The way you talk now is like a painter. BLV: Really? I was actually thinking of those drawings with respect to my movements as a sculptor. I used to sit and draw my movements, then retrace them on acetate, and then project them on a very large piece of paper. I would first roll the ink, then project the form and draw those lines out, and then cut each one out with scissors. In this way, all the drawings are really various abstractions of other abstractions. TM: You would likely appreciate Heinrich Schenker’s analysis of musical compositions, because his diagrams look similar to the forms in your sculpture. BLV: I appreciate musical scores. Cecil Taylor, the jazz musician, composes his scores kind of randomly. And then you have one of my favorite jazz musicians, Anthony Braxton, who only makes diagrams as scores. His scores are just little pictures of a couple of dotted lines with an X and then an oval, or something like that, and that is it. I guess he improvises on that all the time. TM: They are like hieroglyphs? TM: There was a composer from John Cage’s era, Lucia Dlugoszewski. She was known for creating the timbre piano; she played the piano like a harp. Her scores also were symbols, all drawn in china marker in different colors. The other composer who comes to mind when I think of visual scores is Toru Takemitsu, a Japanese composer. Takemitsu’s music is often a metaphor for Japanese gardens, which are often engaged in sculptural issues. Do you have a composer that first captured your interest? BLV: You mean a composer, rather than a jazz musician, who just blows on an instrument without a score? I mean, there are those like John Coltrane who did compose. TM: I guess I am asking about a first musical experience. In art school I was interested in abrasive music, and I thought the Velvet Underground was quite abrasive, with John Cale and his electric viola. And then Coltrane makes kind of layers and layers and layers—that almost seem like noise but are not. And Webern would just drive you nuts. TM: Do you have anything under way now that interests you differently, scale-wise, paper-wise, ink-wise? BLV: I don’t know exactly what I want to do, but I do want to do a whole new series of works on paper, probably starting with some kind of an idea for sculpture. Once I have a pile of drawings ready, I figure out whether there is one that I would like to use as a sculpture or if I should just appreciate the drawings as they are. TM: Is this the way you conceive all of your work on paper as a whole? BLV: Let’s say I can do fifty drawings, and I know I can’t afford to do fifty sculptures based on them. In that case, I leave them on paper. If a sculpture show comes up, I go back to the drawings and say, “I could do this; I could do this; I could do this.” The drawings—whether they are big or small—become like scripts, reminders, thoughts. TM: Conceivably any of them could be translated into a sculpture? If you keep a drawing after, say, making fifty other drawings, is it at the point at which you would consider it for a sculpture? Is that the threshold for keeping a drawing? BLV: I would keep the drawing, because it may be a starting point—the one I become partial to is the one that excites me with more possibilities for sculpture. It’s like composing. TM: Some composers begin with a piano reduction for a larger work, but sometimes the process goes in the other direction, from orchestral score to piano. BLV: One advantage is that I can always start on paper. TM: How did you arrive at using the floor and walls in your drawings, as you do for sculpture? BLV: The drawings on the floor are, shall we say, actual replicas of things that exist. They really are like arranging furniture. The drawings on the wall are really like floor plans. What was depicted on the wall in those double-part drawings, from the Tachycardia series, was me, lying in bed, thinking about how things are arranged on the floor. For example, I did some drawings using an EKG. You can look at an EKG and make a three-dimensional form out of its forms, but they somehow become a different language and become objective in their threatening quality. As long as they are on paper they are not threatening, but if I make them three-dimensional, then they are. That is why the sculpture is basically diagrammatic. TM: Diagrams have an aesthetic presence, but it is your interpretation or translation that is of interest. The way you humanize your source materials, giving feeling to scientific forms, is what is significant. BLV: I make diagrams into art and, basically, I make diagrams into thought. They are probably more like art when they are two-dimensional and less like art when they become sculptural. TM: They read as more cerebral works in sculpture form. BLV: Actually, I think the diagrams are more cerebral. For my sculptures, I extract so much out of the paper, as we discussed, that they become very simple, which really gets to the heart of the matter. TM: Through cropping or reordering the lines and form? BLV: Basically, I could put lines across the top, which could be out of another material. I could change the materials all the way through. I could enlarge the diagram. Somebody will say, “I don’t understand this as sculpture,” but the whole point is, all you need from me is to get a sense of the original form. If it feels electric, then it is electric. It’s not about figure/ground. It’s not about Henry Moore. I don’t think “sculptural issues” are necessarily real issues anymore. Sculpture has to change, or at least the reasons behind making something three-dimensional have to change. TM: I think your work has changed or shifted the language of sculpture. Your compositions have moved ideas about sculpture forward because of the way they are developed so completely. TM: In art and cooking, yes. BLV: Before I can get to work, I want my whole apartment to the way it was when I first moved in—absolutely new and perfect. No coats on chairs, nothing. I want everything empty. I just want to sit down on the surfaces and think and draw and work and think and draw, and eventually find what I am really interested in and what I find personally important to me. Barry Le Va (b. 1941, Long Beach, CA) earned his BA from California State University, Long Beach (1960) and his MFA from the Otis Art Institute of Los Angeles County (1967). In 1968 he was awarded the Young Talent Grant by the Los Angeles County Museum. In 1974 he received the Guggenheim Fellowship for Sculpture and in 1976 the National Endowment of the Arts Fellowship. Le Va has taught at the Minneapolis College of Art & Design (1968), Princeton University (1973), and Yale University (1976). In 2000 he was a finalist for the Hugo Boss Prize of the Guggenheim Museum. Le Va’s most recent solo exhibitions have been held at Dwight Hackett Projects, Santa Fe, New Mexico (2008); David Nolan Gallery, New York (2008, 2010); Galerie Fred Jahn, Munich (2009); Mary Boone Gallery, New York (2009); Nolan Judin Berlin, Berlin (2009); and Marc Selwyn Fine Art, Los Angeles (2010). His most recent group exhibitions have been held at Richard Telles Fine Art, Los Angeles (2008); Mary Boone Fine Art, New York (2009); The Museum of Modern Art, New York (2009); the Whitney Museum of American Art, New York (2009); the Baltimore Museum of Modern Art, Baltimore, Maryland (2009); Danese Gallery, New York (2010); and International Print Center, New York (2010). Le Va lives and works in New York City. Tad Mike (b. 1975, LaGrange, Georgia) Mike completed his BA at the New School University, New York (1998) and his BFA at The Cooper Union, New York (2001). He has worked as a writer, curator, lecturer, photographer, and master printer, among other creative positions. In 2007 and 2012, Mike was resident at the Robert MacNamara Foundation in Westport Island, Maine. He was resident at L’Anglin, Beauvais in Concremiers, France, in 2009. Recent solo exhibitions have been held at the Aoyama Enkei Theatre, Tokyo (2007); the Robert MacNamara Foundation (2007); the University of Nevada, Las Vegas (2005, 2008, 2011); the Nexus Multicultural Arts Center, Adelaide, Australia (2008); the Lamar Dodd Art Center, LaGrange, Georgia (2006, 2009); the Chuncheon Center for Art and Culture, Chuncheon, Korea (2011); and the Peter Lind Hayes and Mary Healy Gallery, University of Nevada, Las Vegas (2011). Mike’s work is shown regularly in New York at Margaret Thatcher Projects and in Berlin at Hamish Morrison Galerie and Fruehsorge Contemporary Drawings. Mike lives and works in New York City. Posted in Barry Le Va, Tad Mike. RSS 2.0 feed.